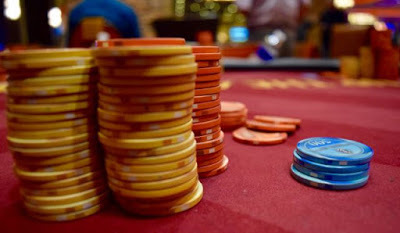 Down big early, wins a flip, then the chips go in the middle preflop - Richard Ropiak has a 3.5-1 chiplead on Chris Hinchcliffe and calls the all-in to put Hinchcliffe at risk..
Hinchcliffe shows Ace_Eight and Ropiak has King_Jack. Ropiak flops two pair, turns a boat to eliminate Hinchcliffe in the first Changeup Semifinal match. Ropiak moves on to face the winner of the Kirk Rexford/Ron Cristian Semifinal. He will have a 308,000-252,000 chip advantage to start the match. Hinchcliffe cashes for $500, his second cash in the $100k Series.